We are pleased to announce that to celebrate the twentieth anniversary of the North East Help Link trust, we are making available a unique calendar, depicting our work. Proceeds from the calendar will go directly to helping our clients. 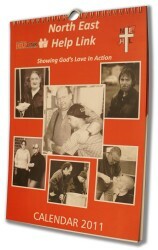 The work of North East Help Link Trust carries forward the vision of showing God's love in action to the homeless. It is made possible by your generous gifts. We are grateful for your help and support, past, present and future.